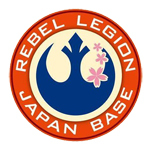 Japan Base serves the Rebel Legion all over Japan. It originally started as an Outpost in 2006 and became the Base in 2007. We follows the mind of the Rebel Legion and makes quality costumes of various star wars characters. Japan Base recruiting new members and deepening relationships with each fan and every Star Wars fan group. We actively participate in volunteer activities and events, and deepen exchanges with people and star wars fans.